“It was vital, imperative, natural, instinctive. Perhaps we arrived at a musical universe, or perhaps we created it”, says Ramy Zoghlemi. He grabs his exuberant beard and funnels down it with one hand, while staring at a little espresso coffee cup on the table. Seated alongside is his collaborator, Sabrine Jenhani. 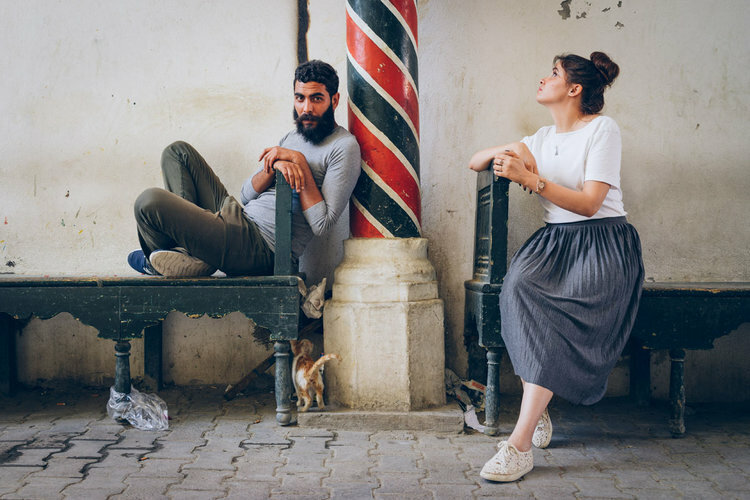 Together, they are Tunisia’s folk duo Yuma. Yuma’s music is lovely; intimate, melodic, melancholic, powerfully simple. They combine Tunisian dialect with hints of western, almost Celtic melodies. 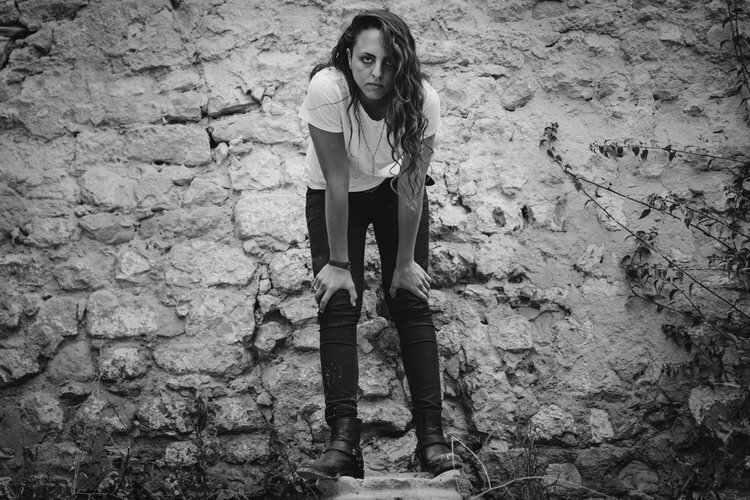 Sabrine‘s voice is fully emotive, forceful yet fragile. Ramy accompanies with deep, breathy vocals, while playing acoustic guitar. I saw them play the week before at the Rio cinema in downtown Tunis. The place was full, and filled with an excitement that was palpable and contagious. It was thrilling to see people responding to a performance in this way. I found myself wondering why the crowd was so excited. It takes 3 minutes online to realise that Yuma produce music that is highly accessible to the western ear. As a blend of local dialects and sonorous, expansive melodies, perhaps it was simply the originality of the music, its novelty in this setting, that was so exciting to everyone? 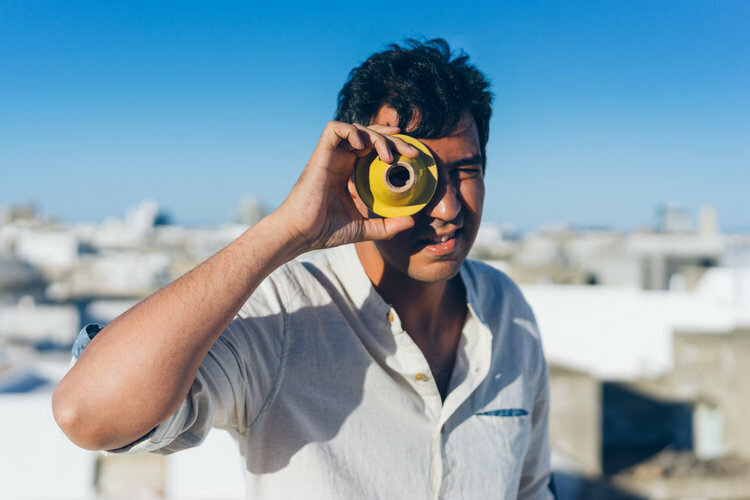 But when we meet, a week later, in a café in the Tunis centre ville, Ramy offers another clue: “Sabrine and I are representing a Tunisian youth that has a great thirst for music, but also for love, hope and grace”. The primary musical vehicle for Tunisian youth culture is hip hop. Also delivered through dialect, it appears to offer mainly anger and swagger for those looking to embody the genre. Yuma offers an alternative. Through Yuma’s music, Tunisians can share in the celebration of their language, idioms and adages, within a genre, folk, that accommodates a wider gamut of emotions. As such, when Ramy says, “we have become spokespersons for a generation” it begins to make sense. It has all happened very quickly for Yuma. They formed just over a year ago, in late 2015. Their break came in the summer of 2016, when they played at the Hammamet music festival, seen as Tunisia’s most important music event. The rest is starting to become history. They are working on a second album, called ‘Stardust’. Sabrine, 30, and Ramy, 28, are gaining a national, or even international, following. Yuma’s popularity must also be seen in the context of a Tunisian culture that, for all its liberalism vis-a-vis other Maghreb and Arab countries, remains conservative. The duo’s decision to abandon steady jobs to pursue a career in music is unusual. 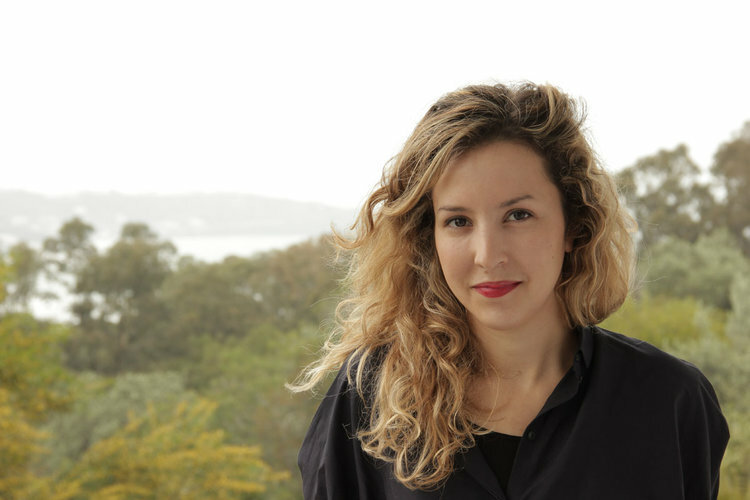 For Sabrine to collaborate with a man, in an industry dominated by men, is also unconventional. For young Tunisians their courage must be inspirational. “To an extent we have become cultural figures. It wasn’t deliberate. It just happened because of our expressing ourselves. It was through our desire to be personally satisfied” says Sabrine. And here lies a final insight into the duo’s reception at the Rio cinema. Yuma are pursuing their purpose on their own terms. They do not pursue any overt political agenda, but their freedom of expression is a political act in the context of Tunisian society. Their art is theirs. This exposure is vulnerable, and therefore connecting. I ask about the sadness I hear in their music. Sabrine responds “C’est moins triste que intimiste [It’s less sad than intimate]”. What matters, she later says, is “to be real”. With the courage of this conviction, in their quiet way, Yuma are making big noises on Tunisia’s cultural scene. The name of the upcoming Sadler’s Wells dance festival is both a memorable pun and acknowledges that substantively, it’s breaking the conventions of both genres of performance art it has adopted. Breakin’ Convention is hip hop theatre; a fascinating affront to both contemporary dance and standard b-boying (break dancing). Somewhere between the stagecraft of bourgeois theatres and the busting energy of South Bronx dancehalls, curator and host Jonzi D has found a beautiful niche. But what of hip hop being ‘produced’ at a venue like Sadler’s Wells? What of a movement that was once so raw, rooted in the street, moving into the realms of ‘high art’? Jonzi is one of those people you instantly warm to. We’d first met by chance at a house party in Kampala, Uganda, and then coincidentally again at Entebbe airport before sharing a flight back to the UK. Now we talk at the Sadler’s Wells cafe. Beneath a huge bulbous hat filled with dreadlocks is a rounded, thoughtful face. Jonzi likes to enunciate words that are important, stretching them out and emphasising their syllables. He is clear and convincing. Yet still I question the philosophy of putting hip hop into theatres. Jonzi’s story goes right back to the origins of underground British hip hop, b-boying and MCing with the UK’s first wave from 1982. Increasingly drawn to breaking, he graduated from the London Contemporary Dance School in 1993 and set up his first Hip Hop Theatre in 1995. Jonzi began touring a production called Lyrikal Fearta around Europe that year and realised that others were also onto this hip hop dance combination; it was a genre unto itself. In 1999 Alistair Spalding, then working at the Royal Festival Hall, saw Jonzi’s production of Aeroplane Man, about a displaced young man of Grenadian origin living in east London. Spalding recognised the significance of Jonzi’s work and five years later, as artistic director at Sadler’s Wells, he commissioned Jonzi to develop a hip hop dance festival. Breakin’ Convention was born. They hit it off immediately. Spalding gave Jonzi free license to fully capture the essence of hip hop culture, revolving around its four elements: MCing, DJing, breaking, and graffiti. In this eighth successive year at Sadler’s Wells, Breakin’ Convention promises to capture the truly global nature of hip hop, with dancers representing France, Korea, Japan, the UK, US and Uganda. One of the highlights of the programme is Ugandan crew, Tabu-Flo, the first time a group from sub-Saharan Africa have been involved in Breakin Convention. The group met at Kampala’s Breakdance Project, a non-profit organisation working to promote social change. In a country where hip hop culture is phenomenally popular, it’s a direct way to connect with young people. The piece Tabu-Flo created for their London show is inspired by the story of a battle with malevolent spirits. “Tabu-Flo are working with a local myth called the night dancers: that humans go into trances at night; they possess people; they dig up freshly buried bodies at night and eat them… it’s extraordinary”, explains Jonzi. Under the creative control of Jonzi, and amid the dynamics of global hip hop and diverse ethnic cultures, the possibilities are endless. The impetus is to keep exploring; to do something different. So far, Breakin’ Convention is living up to its name. This was a concert with an edge. Circumstances conspired to lift this performance from one of beautifully arranged and composed music onto another level; here crowd and artist shared not only in each others’ sounds, but in their souls too. Arguably Ivory Coast’s most political contemporary musician was performing his most politically conscious album, at a time when his country had sunk into a civil war that has cost some 1500 lives. “Nobody hoped the situation would reach this stage. Il faut cedez le fauteuil, le pouvoir [literally, you must hand over the ‘presidential armchair’, power]” Tiken Jah Fakoly tells me, in reference to Ivory Coast’s former president, Laurent Gbagbo, who lost the election to Alassane Ouattara but refused to cede control. At the time of this interview, Gbagbo was desperately clinging to power whilst hiding in a bunker under his house in Abidjan. That night, 4 April 2011, the Barbican theatre was almost entirely on its feet, swaying to reggae melodies layered with distinctly West African sounds drawn from the charms of the kora, ngoni, and balafon (all recently added to his band). An Ivorian fan from the crowd, draped in his national flag, ran across the theatre and up onto the stage, handing Tiken the emblem in a purely symbolic gesture. “The European Union, the United States, the African Union – they all demanded Gbagbo leave, and he refused. In history, sometimes force is the only way. Negotiating didn’t work. Sadly we arrived at this situation” laments Tiken, whose rusty voice in itself seems to carry the pain of a nation’s suffering. One could be forgiven for believing Tiken Jah Fakoly had been building his entire career up to this moment. African Revolution was released in late 2010. Perhaps the album’s most memorable song is Political War, featuring Nigerian soul singer Asa, who performed alongside Tiken at the Barbican. It’s a plaintive story of political disillusion based on their parents’ experiences in Ivory Coast and Nigeria. Their eponymous chorus rings in the ears like the wailing of the bereaved. Tiken was performing for the first time in London just as the violence in Ivory Coast had intensified into one of the world’s worsening humanitarian crises. This was a concert that mattered. But in fact, lyrically, Tiken’s music has been politically conscious for some time. From 1993 he began to move away from the metaphor traditionally adopted by griot musicians, which is his heritage, into more direct political attacks after the death of Ivory Coast’s long-standing president Félix Houphouey-Boigny. “I think if the politicians had listened to me years ago, things would not have turned out this way. In Le Caméléon (first released across West Africa in 2000, then internationally in 2008), I made it clear to people in West Africa that things were bad, that they had to stop, and I wasn’t alone – Alpha Blondy and Ismaël Isaac were also saying politicians needed to be checked. This approach has both increased his regional and international popularity and risked him his life. Subjected to death threats, he left Abidjan in 2003. He was then banned from Senegal after criticizing its president in 2007 and over the past few years exiled himself in Bamako, Mali, due to the political instability blighting the Ivory Coast. In the complex world of international politics and advocacy in which Tiken now operates, which would be the one change he would like to see in African politics. What of the role of the external actors, the western donors? If any artist could embody this route, it would be Tiken Jah Fakoly. Musically, African Revolution is a conscious statement. It encompasses his early adoption of roots reggae, particularly Bob Marley’s, and indeed was partly recorded at Tuff Gong studio in Kingston. But the bulk of the album was produced and recorded in Bamako, under the instrumental influence of West Africa, his homeland. Ideologically, he’s clasped the torch of Peter Tosh, Marley and Ivorian reggae musicians to become a ‘truth teller’, speaking up against injustice. And for sheer on-stage bravura – with statuesque Black Panther salutes, cross-stage sprints, jumps, and flying kicks to drum beats – I saw him as African reggae’s answer to Mick Jagger. Tiken has developed an enormous following in West Africa. His 2003 Victoires de la Musique Award is a testament to his popularity in France. The growing fanbase across the world support him not just for his wonderful music but for his courage. At the time of writing, his country’s erstwhile despot has reportedly fallen and the curfew has been lifted. Perhaps a new chapter is opening for Ivory Coast. Everyone is hoping it won’t be one of violence. Come what may, Tiken’s voice will continue to sound, loud and clear. Traoré grew up listening to the music of legendary Guinean griot Sory Kandia Kouyate and British group Dire Straits. Traditional West African and guitar-based western music were already becoming broad sources of musical inspiration. But ironically it was rap that made Traoré’s name in Mali. Influenced by the likes of Public Enemy and Snap! Traoré and her brothers formed a hip hop collective called “Let’s fight”. Two of their songs were aired on national TV. Following her mother’s advice, however, Rokia returned to her roots. By 1997 she was collaborating with Ali Farka Touré, who would become a major figure in her life, and over the next six years Traoré produced three critically acclaimed albums. The latest, Tchamantché, won her the best artist award of the 2009 Songlines Music Awards. The album is an intriguing collection of music, sensuously combining bluesy Gretsch guitar licks with West African ngoni plucks to produce a distinct sound, softened by jazz drum patter and Traoré’s feminine voice that can somehow sound forceful yet fragile. Traoré sings mostly in Bambara, yet the album includes songs in French and English. Her dazzlingly original version of Gershwin’s ‘The Man I Love’ reflects her willingness to invert existing standards. This same characteristic saw Traoré construe Mozart as a thirteenth century griot of the Mande Empire for director Peter Sellars at the New Crowned Hope festival in 2006. Held in London and Vienna, the festival was celebrating the 250th anniversary of the Austrian composer. Traoré’s artistry clearly doesn’t shirk from the big occasion. As we near the end of our interview, I understand that Rokia keenly wants others less fortunate to have the chance to learn too. Since December 2009 Traoré has invested her energies in Passerelle, (meaning ‘bridge’ in French) her foundation which aims to help develop Mali’s music industry by providing artists with greater opportunities to play. She has the advantage of her childhood upbringing, giving her know-how when it comes to forging third sector partnerships. The Fondation Passerelle’s first live event will take place on the Niger riverside by Mali’s capital in mid-May. If she can achieve a fraction of her success as a singer songwriter in this endeavour then Bamako’s young hopefuls should be counting themselves very lucky. 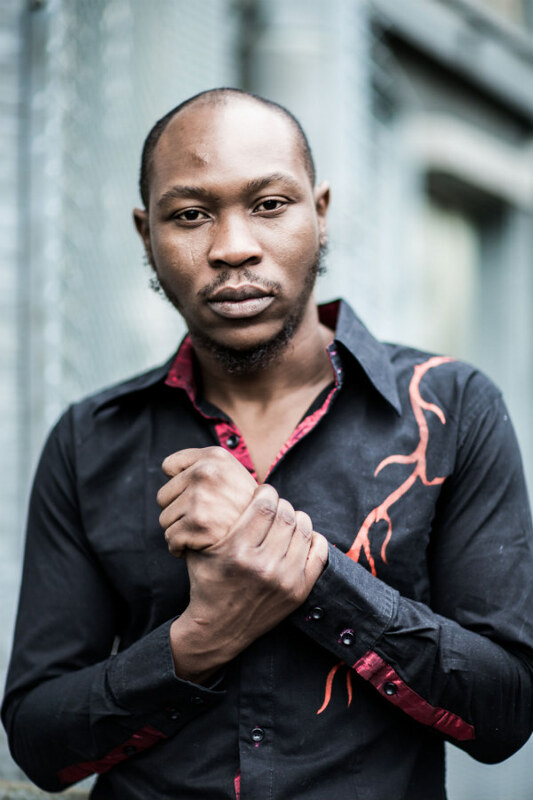 “Music can do anything” says Seun Kuti. His eyes flash with a youthful energy, dominating a round face with grizzly scrubs of facial hair. Few African artists would understand this better than Seun Kuti. Born into a Yoruba family of unusual cultural and political engagement (writer and Nobel Laureate Wole Soyinka is a relation), the Nigerian 28 year-old’s fate is unique. He’s the youngest son of the legendary founder of Afrobeat music, Fela Kuti, whose reputation as political rebel is virtually without equal in the history of modern African music. Fela Kuti’s 1977 album Zombie was a scathing attack on the complicity and brutality of Nigerian soldiers working under the country’s military ruler General Olesegun Obasanjo. The release and popularity of the record caused such controversy that Fela’s commune and recording studio, the Kalakuta Republic, was attacked and burned by a thousand soldiers, with several killings and Fela suffering torture. After his death from AIDS in 1997, more than a million people attended Fela Kuti’s funeral at the site of the Shrine, his old nightclub, which had also been destroyed by the military in the late 1970s. While Afrobeat was a tremendously exciting genre musically, this kind of following came from the way Fela Kuti spoke to, and for, the masses. Fela’s appeal was extraordinary because he voiced the biggest political and social problems that no-one had previously even dared to do, let alone so directly, publicly and emphatically. Seun is standing his ground across the treacherous political landscapes that blight so many African countries. To him the perfidious role of the ‘international community’ is as aggravating as the corruption that mars national development on the continent. “They are all dancing in Africa to tunes being played in the West” he concludes forcefully. Would he choose a career in politics? “I’m already a politician. Not a professional politician. I’d like to create a group of authentic African politicians [reviving Fela’s Movement of the People party has been cited as an idea]. I love my role as a critic” he says. But isn’t the real challenge in making tough political decisions? “If you have political responsibility for a long time, you get tunnel vision” he responds, adding, “a leader is only as good as his advisers.” His conversation is compelling; insightful, provocative and humorous. Seun has recognised that he can be more than his father’s son. 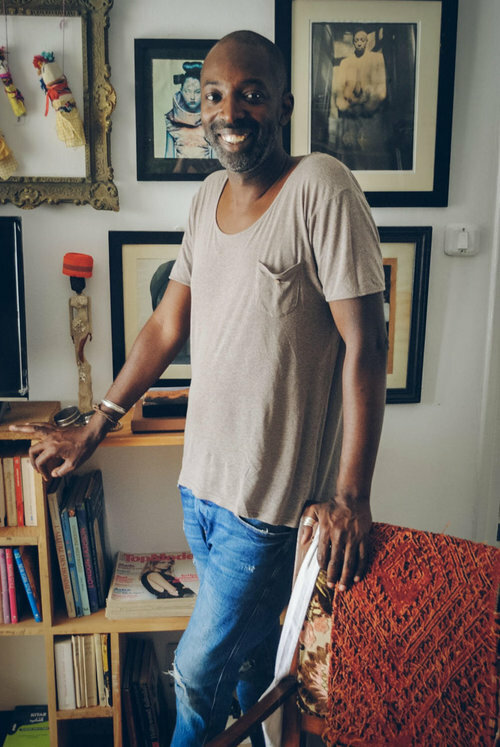 Since becoming the lead singer of Fela’s old Egypt 80 band at the age of 14 in 1997, he’s embraced his heritage but adapted himself both musically and politically to our times. His latest album, From Africa With Fury: Rise with Egypt 80, still includes many of the old musicians, and still channels jazz, funk and high-life-inspired Afrobeat music, but has been produced in London with Brian Eno, a production legend in his own right and pioneer of Ambient music. And whereas Fela would mostly rile against military dictatorship, today Seun is attacking multinationals like Monsanto and Halliburton. Seun’s political diatribe is offset by a lighter exuberance to his personality. Clearly an entertainer in the mold of his father, Seun has a habit of performing half naked on stage with just a sax slung over his neck. We talk about hip hop production in Africa and he feels disappointed by “people promoting bubblegum hip hop” and sneers at “David Guetta on the beats!” adding “but I love it when I’m in a club and I’m drunk, [laughing]”. If anything, being Fela’s son and part of such a family seems to have taught Seun that he can be anything he wants, and simultaneously be all these different things. Like his father, Seun, I sense, will make people laugh, cry, love and rage all at the same time. Which of course makes him a fascinating and powerful individual, and one well worth listening to. In the galaxy of West African music, Oumou Sangare really is one of the brightest stars. She was a star in Mali before Nick Gold went to Bamako in 1991. When the World Circuit label founder visited that year, he said he heard the same beautiful voice being played out on cassettes at markets, in cafés, shop stalls, bus stations. All over the city, Oumou Sangare was in the air. “You couldn’t escape that music. And you didn’t want to. It was everywhere. As soon as you left a café where they were playing it, the baton was taken up by a passing car and then the next market stall. I spent that week in Bamako hearing Oumou wherever I went. And I mean everywhere” he says. She was 22. After signing to Gold’s label, Sangare’s debut Moussoulou (‘Women’) became an international phenomenon and, along with Salif Keita and Ali Farka Touré, she was an early global ambassador for music from Mali, a country that has more recently given us Amadou & Mariam and Bassekou Kouyaté. 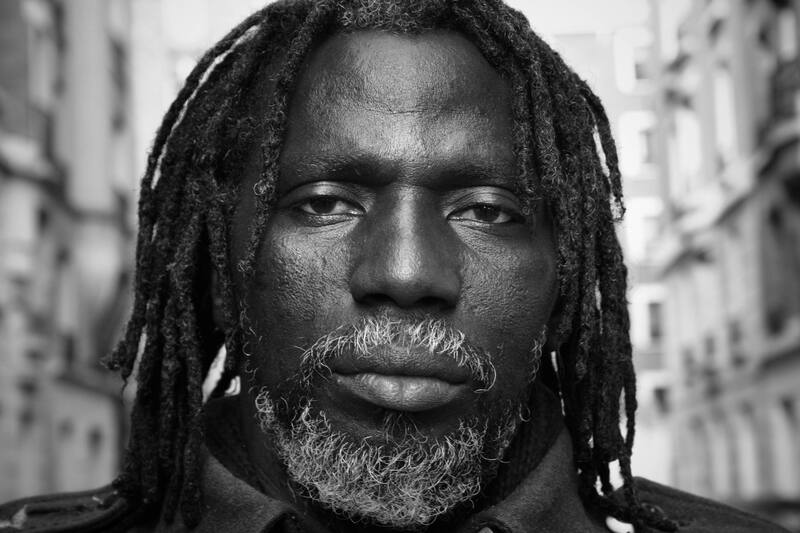 Sangare is gifted with a voice that can ululate like birdsong yet carries with it enormous emotional depth. Her upbringing was anything but easy. With an absent father, and a mother who often had to leave the household when Sangare was a girl, she grew up fast. “I was the mother, I was the father, at the age of 13 I was already head of the family. And that’s what has given me strength in my life. I learnt very early how to be responsible.” At this early age Sangare learnt how to be tenacious, and how to make money. And her greatest resource was her voice. “I’d wait until I heard a djembe…I would throw myself in the middle of the crowd and sing. When I opened my mouth…wow! People would give me coins.” This combination of talent and determination eventually brought Sangare enormous success. “Since I’d been absent for a while, my intention was to produce something joyful”, she says, then adds, “but in amongst that joy I always take the opportunity to slip in messages that educate my nation and my country.” Part of Sangare’s huge appeal is her ability to simultaneously communicate both traditional and modern themes within her songs. Seya is rich with reference to her family’s Wassoulou culture. Donso is a song about the hunter-warrior caste who used to protect towns in pre-colonial days. Other songs reflect Sangare’s more modern ideas, albeit set in time-honoured themes. Sounsoumba (‘Big tree’) concerns a girl who before marrying was a Sounsoum Ba, a big tree, vibrant and alive, whose many branches signify her many friendships, but once forced into marriage she becomes a lonely, little tree stump. Sangare’s outspoken campaigns for women’s rights have made her a powerful, if at times controversial, figure in Africa. She is an Ambassador of the United Nations Food and Agriculture Organization as well as other organizations that look for role models who speak out against gender inequality on the continent. “In Mali I became famous for the message contained in my music – the rights of women, the rights of children too.” While there is often a social and political significance to her songs, Sangare’s popularity comes above all from the sheer quality of her music; the rhythms, the melodies, the instrumentation and of course, her extraordinary, deeply moving voice.